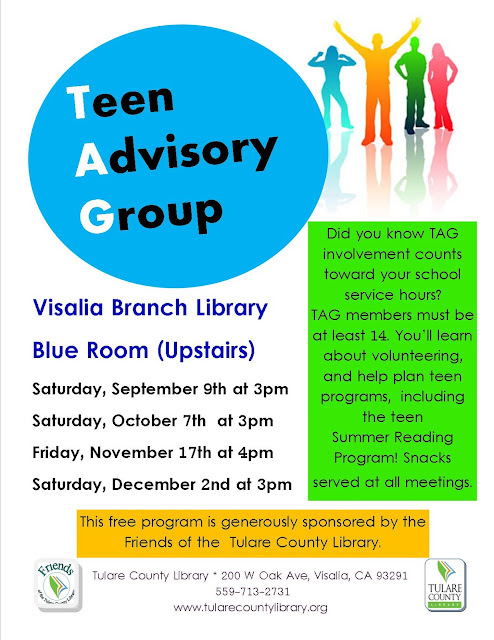 Teen Advisory Group (TAG) starts back up on September 9th at at 3pm. Saturday, October 7th at 3pm Friday, November 17th at 4pm Saturday, December 2nd at 3pm. We meet once a month to plan future programs, including Summer Reading Program, our first annual Fallfest, a (possible) Yule Ball, and more! Discuss current teen lit, movies, music, and anything else on your mind. Snacks served! In between meetings, teen volunteers can work on a variety of different projects.